A 50 year-old man required intubation for seizure control after he presented in status epilepticus. His past history is notable for a brain tumour resection 5 years previously. Aside from the tip of the endotracheal tube being less than 2cm from the carina (i.e. a touch too low), the important abnormality is an injury affecting the right glenohumeral joint and proximal humerus. 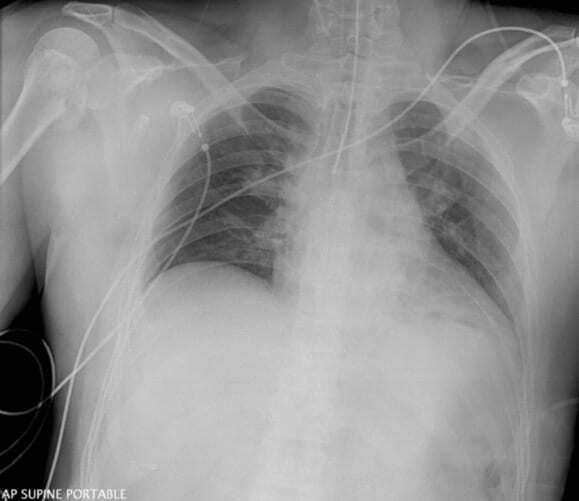 This image is a useful reminder that structures outside of the thorax should be scrutinised as part of a systematic approach to chest radiograph interpretation. Q2. What further imaging should be performed? 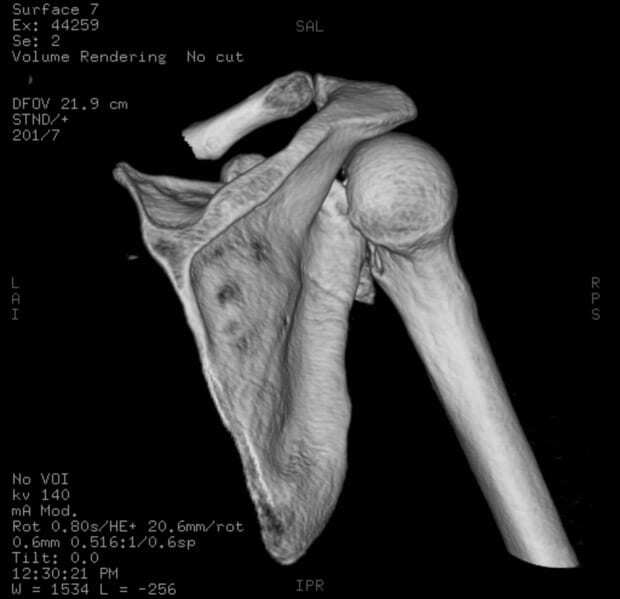 To characterize the injury further, a CT scan of the right glenohumeral joint was performed. These images show a subacromial posterior dislocation of the right glenohumeral joint with a complex defect of the humeral head. 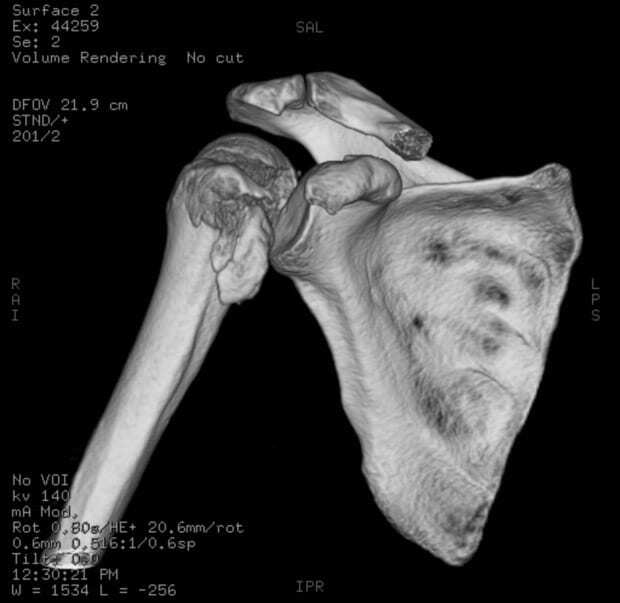 There is a comminuted fracture consisting of 3 parts with separation of both the greater and lesser tuberosities from the rest of the humeral head. Q3. What is the mechanism of injury? Posterior shoulder dislocations can occur during seizures because tetanic contraction of the muscles causing internal rotation and posterior displacement is stronger than the opposing muscles. 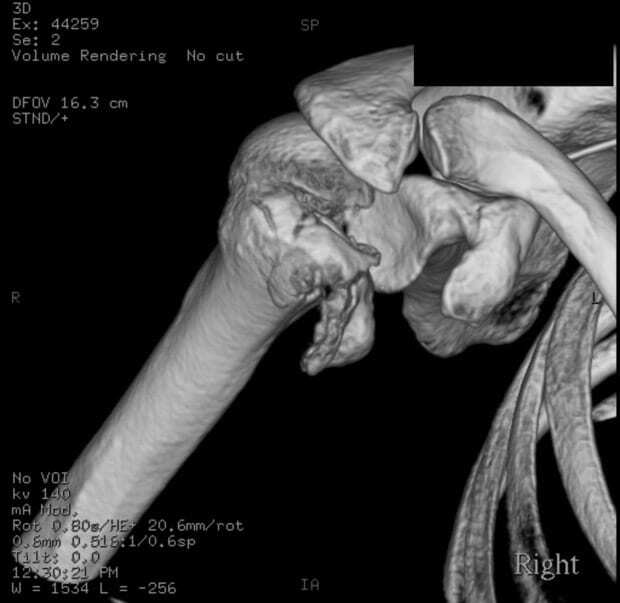 The fractures in this case were probably caused by a combination of the impact on the glenoid on the humeral head and avulsive forces from the muscles that insert on the greater tuberosity (supraspinatus, infraspinatus and teres minor) and the lesser tuberosity (subscapularis). A vertical impaction fracture on the anteromedial surface of the humeral head is known as a trough line or reverse Hill-Sachs deformity. Extremely high Energy trauma (even a nasty fall onto an outstretched medially-rotated upper limb could do it). 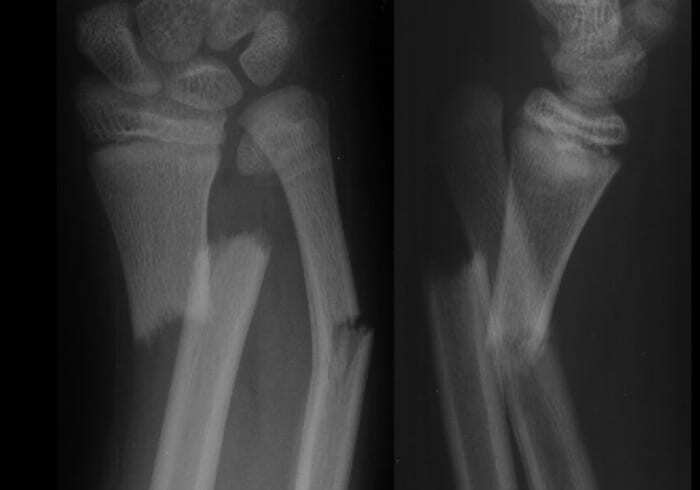 Unless specifically looked for, posterior dislocations accompanying a proximal humerus fracture can be easily missed. This man’s dislocation was reduced while he was intubated and sedated with a view to subsequent operative repair. Reduction was achieved by applying axial traction in line with the humerus, with some anterior pressure on the humeral head, followed by a combination of ‘gentle’ flexion, adduction and external rotation. An associated rotator cuff tear may also be present.